Lodwar is a small but growing town in Turkana County, in the dry north-west of Kenya. As a small town in a fragile environment, its development challenges include high poverty rates, rapid population growth, and insufficient piped water service. Far from Nairobi, Turkana has long been characterised as marginal and isolated from the rest of Kenya. In the absence of government attention, many public services have historically been provided by churches , NGOs and foreign donors. Since devolution in 2013, the new county administration has brought more visibility to government at the local level. A wide range of old and new organisations are now attempting to tackle water security issues, but funding and co-ordination are limited. Factors outside the town – including a hydroelectric dam, oil exploration, irrigation schemes, refugee resettlement camps, and rural pastoral economies – also affect the situation in Lodwar. In December 2016, REACH researchers travelled to Lodwar to study the links and mismatches between information and decision-making in the water sector. We interviewed government and civil society representatives to find out who makes water decisions that affect the town, and how they deal with incomplete or uncertain information; whether they use weather or climate forecasts to aid planning – and why, or why not it might be the case; and what other types of information are needed. 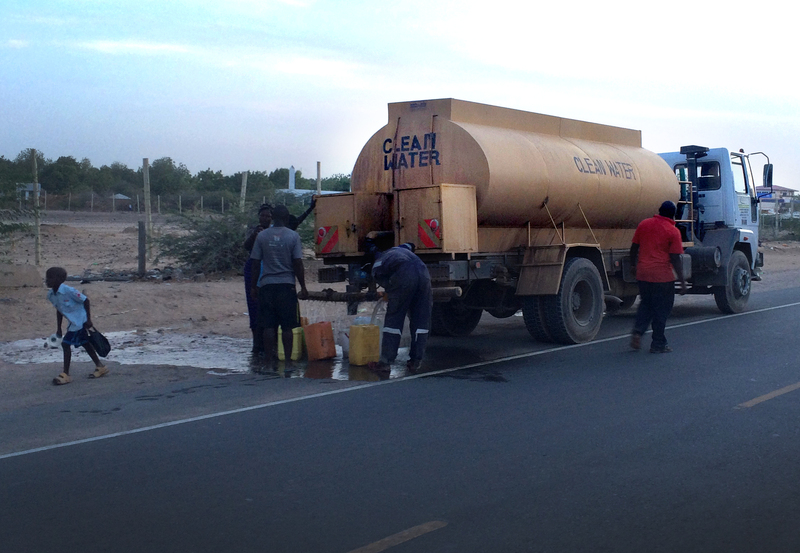 Most people in Lodwar rely on groundwater sources for their water supply. The municipal service provider LOWASCO uses electricity to pump water from shallow boreholes near to the Turkwel River, while alternative water points in the town and surrounding areas include boreholes with wind, solar, and handpumps. During our visit, the town water supply failed for several days. Such failures place major burdens on the poor – both those who lose access to their regular piped supply, and those living in peri-urban settlements beyond the main supply area, whose alternative water sources are put under additional pressure by increased demand from urban dwellers. This leads to shortages, long queues and increased prices. The dry climate and unreliable rains of this part of Kenya contribute to water insecurity, but often it is factors such as system maintenance, leadership, and relationships between local government and their contractors that are critical. We found that weather and climate information is being combined with other relevant knowledge and embedded in drought management programmes. The most popular source of this information was the local office of the National Drought Management Authority (NDMA). The NDMA brings together data from different sources and translates it into early warning bulletins and advice. As well as weather and climate observations and forecasts, these warnings take into account indicators such as livestock prices, nutritional status, and migration patterns. Since devolution, multi-stakeholder forums including the County Steering Group provide space for organisations to share information and co-ordinate decisions. However, to date they lack ‘teeth’ and this limits how much information they can compel organisations to share. During our stay we observed an effort to bring together scientific and traditional expertise to plan for future environmental conditions. A ‘Participatory Scenario Planning’ workshop organised by the NDMA brought together meteorologists from the Kenya Met Department and ritual specialists from the Turkana community. First, the meteorologists presented a seasonal rainfall forecast based on computer modelling and statistical methods. Then, the emuron, or ‘seer’, slaughtered a goat and interpreted its entrails to present his own forecast of patterns of rain, flooding, disease and conflict. Afterwards, the two forecasts were compared and workshop participants discussed advice that could be given to different sectors based on the information from both sources. The workshop raised many questions about power, expertise, credibility and participation, which we explore in more detail in our new working paper: Weather and climate knowledge for water security: institutional roles and relationships in Turkana (available here). Our research into institutional roles and relationships in the Lodwar observatory highlighted potential for further strengthening of local reporting and data sharing mechanisms, and the meaningful engagement of a wider group of people and organisations in deliberation and planning activities. The insights gathered during this social science investigation will feed into ongoing interdisciplinary work by the REACH Kenya team, including an audit of water infrastructure and services, and further research into the linkages between poverty and water (in)security. As part of a long term collaboration with the Turkana County Government, the University of Nairobi and UNICEF Kenya, the REACH programme is working to help Lodwar respond to its development challenges to ensure inclusive water services for all.